"Estoy super contenta, con Uniart, tanto con las piedras que encargo, y sobre..."
Organza gift bags. Pack with 100 pcs organza bags with assorted colors and drawings, as taught the photos. Approximate size of each bag: 9 cm x 12 cm. 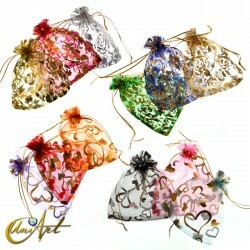 Organza bag with ideal size for pendants, bracelets and medium items. 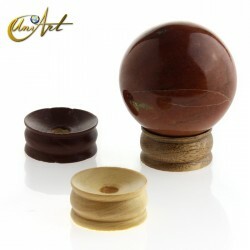 Handmade wooden base for spheres. It is a simple base, which supports various sphere sizes. With this base it is possible to expose the sphere to smooth surfaces without moving. Size wooden base area: 4.5 cm in diameter and about 2.5 cm high. It is possible to choose between two colors: natural wood and wood painted brown. Base with three legs, wooden craft, for spheres. Wooden base with three legs of rustic finish for various sphere sizes. With this base you can position the sphere for display without moving. Size wooden base with legs to sphere: 4.5 cm in diameter by 4.5 cm high, approximately. Packaging and accessories for shops.